Elegant is the perfect description for this bridal ring set from Apples of Gold. A single sapphire gemstone gives off a distinctive blue color that glistens in the light. 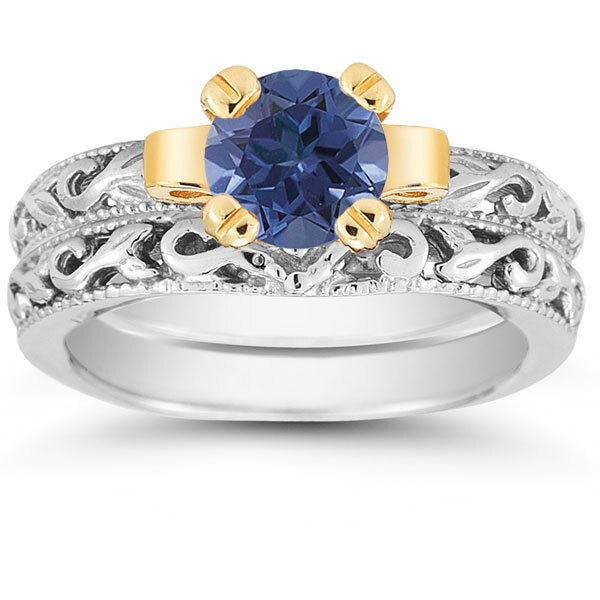 The 6mm sapphire stone is round cut for added appeal, and it is perfectly contrasted with the 14K yellow gold setting. This golden hue mounts the sapphire high above the 14K white gold bands. Each ring is crafted to reveal art deco designs that keep this bridal ring set magnificent at every turn. 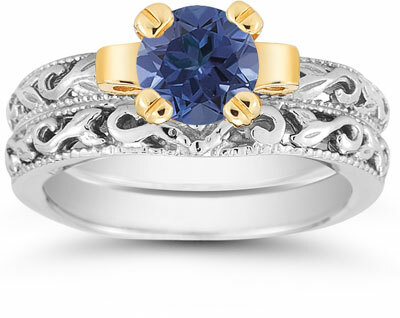 We guarantee our 1 Carat Art Deco Sapphire Bridal Ring Set to be high quality, authentic jewelry, as described above.